Karina's Kreations: Lovely As A Tree! After all these years this is still one of my favorite stamp sets. It's called Lovely as a Tree and works for all occasions. I wanted to create a tree with two colors. The tree image was inked with Pear Pizzazz classic ink. Then a sponge dauber was dipped in Night of Navy ink. 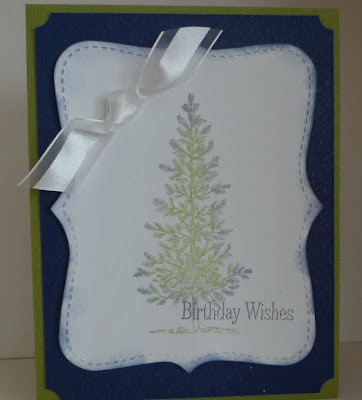 Touch the dauber to edge of the tree and stamp on Whisper White card stock. The greeting is a level 3 hostess stamp set called Occasional quotes. The greeting was stamped with Versamark ink and embossed with Silver Emboss Powder. To add some sparkle to the tree, I made some shimmer mist and sprayed the card. I took an empty bottle from the dollar store and poured in 70% rubbing alcohol. I added three drops of Frost White Shimmer Paint, shook the bottle and sprayed the entire card. It dries quickly and adds a beautiful sparkle to the card.